10/30/17 Honda (american honda motor co.) is recalling certain 2008-2012 accord, 2010-2012 accord crosstour, 2006-2011 civic, 2007-2011 cr-v, 2009-2012 fit and pilot, 2010-2012 insight, and 2009-2012 acura tsx vehicles that received replacement passenger frontal air bag inflators. one dealership may have incorrectly installed the replacement air bag inflators. 08/31/17 Honda (american honda motor co.) is recalling certain 2017 honda cr-v 2wd and awd vehicles. the affected vehicles have a fuel supply pipe that may have been improperly manufactured, possibly resulting in the pipe disconnecting and leaking while driving. Owners may also contact the national highway traffic safety administration vehicle safety hotline at 1-888-327-4236 (tty1-800-424-9153), or go to www.safercar.gov. 08/03/17 Honda (american honda motor co.) is recalling certain 2007-2011 honda cr-v vehicles which have had the passenger frontal air bag replaced. the air bag inflator repair kit may have been assembled by the supplier with an incorrect wire harness. 06/20/17 Honda (american honda motor co.) is recalling certain 2015-2016 honda cr-v vehicles that recently received a replacement engine. the replacement engine may have been built with the wrong pistons, potentially affecting the engine's performance. 11/13/15 American honda motor company, inc. (honda) is recalling certain model year 2016 cr-v vehicles manufactured october 12, 2015, to october 19, 2015. the metal housing surrounding the driver's air bag inflator in these vehicles may have been manufactured incorrectly. 07/01/15 Honda (american honda motor co.) is recalling certain model year 2001-2005 honda civic vehicles manufactured march 21, 2000, to january 20, 2005, 2001-2004 honda civic gx vehicles manufactured june 14, 2000, to august 19, 2004, 2003-2005 honda civic hybrid vehicles manufactured february 24, 2002, to january 18, 2005, 2003-2007 honda accord vehicles manufactured february 21, 2002, to august 28, 2007, 2002-2004 honda cr-v vehicles, 2002-2003 honda odyssey vehicles manufactured june 19, 2001, to july 12, 2003, 2003 acura mdx vehicles manufactured september 19, 2002, to june 19, 2003, 2003 honda element vehicles manufactured june 25, 2002, to july 31, 2003, and 2003 honda pilot vehicles manufactured november 26, 2001, to august 21, 2003. the affected vehicles have a passenger side frontal air bag that may be susceptible to moisture intrusion which, over time, could cause the inflator to rupture upon its deployment. 11/02/12 Honda is recalling certain model year 2002-2006 cr-v passenger vehicles, manufactured from february 19, 2002, through july 28, 2006. the driver-side power window switch may fail or melt. If the switch fails, it could overheat, smoke, and cause a fire. a switch failure, and a fire, could occur even if the vehicle is not in use. as a precaution, owners are advised to park outside until the recall repair has been performed. Honda will notify owners, and dealers will inspect and repair the switches, as necessary, free of charge. the safety recall began on november 2, 2012. owners may contact honda at 1-800-999-1009. Honda's campaign recall number is s61. owners may also contact the national highway traffic safety administration vehicle safety hotline at 1-888-327-4236 (tty 1-800-424-9153), or go to www.safercar.gov. 08/27/11 Honda is recalling certain model year 2005-2010 accord, 2007-2010 cr-v, and 2005-2008 element passenger cars manufactured from july 1, 2004, through september 3, 2010. the outer race of the secondary shaft bearing may be broken during certain driving styles. a broken outer race may cause abnormal noise, the malfunction indicator light to turn on, and allow contact between the transmission idle gear and an electronic sensor housing within the transmission. Honda's recall campaign number is r89.owners may also contact the national highway traffic safety administration's vehicle safety hotline at 1-888-327-4236 (tty 1-800-424-9153), or go to http://www.safercar.gov . 08/02/06 On certain passenger vehicles and motorcycles, the owner's manuals contain incorrect contact information for the national highway traffic safety administration's (nhtsa) vehicle safety hotline. Honda will send a postcard to dealers and owners with the correct nhtsa vehicle safety hotline information and with instructions to insert the card into the "reporting safety defects" section of the owner's manual. the recall began on august 2, 2006. owners may contact honda at 1-800-999-1009, acura at 1-800-382-2238 or honda motorcycles at 1-866-784-1870. 12/31/69 Honda (american honda motor co.) is recalling certain 2003-2012 honda accord and pilot, 2010 accord crosstour, 2001-2011 civic, 2002-2011 cr-v, 2003-2004, 2006-2008 and 2011 element, 2007 and 2009-2013 fit, 2010-2012 insight, 2002-2004 odyssey, and 2012 ridgeline vehicles. the front passenger air bag may have been installed incorrectly during replacement. Honda will notify owners, and dealers will inspect and, if necessary, replace the passenger frontal air bag module assembly, free of charge. the recall is expected to begin june 2018. owners may contact honda customer service at 1-888-234-2138. honda's numbers for this recall are k1p, and m1o. 03/27/15 Engine American honda motor co. (honda) is recalling certain model year 2014 accord l4 vehicles manufactured july 29, 2014, to july 31, 2014, 2015 accord l4 vehicles manufactured august 14, 2014, to january 30, 2015, and 2015 cr-v vehicles manufactured september 9, 2014, to february 6, 2015. the affected vehicles may have been assembled with improperly torqued connecting rod bolts, which can cause the engine to lose power or leak oil. Loss of engine power may result in a vehicle stall, increasing the risk of a crash. if the engine leaks oil in the proximity of hot engine or exhaust components, there is an increased risk of a fire. Honda will notify owners, and dealers will replace the engine short block, free of charge. the recall began on march 27, 2015. owners may contact honda customer service at 1-888-234-2138. honda's number for this recall is jp2 (for accord models) and jp3 (for cr-v models). 11/03/03 Engine On certain sport utility vehicles, metal particles in the key cylinder body could interfere with the interlock lever operation, making it possible to remove the ignition key without shifting the transmission to "park." If the vehicle operator does not shift to "park" before removing the key and fails to engage the parking brake, the vehicle could roll and a crash could occur. Dealers will inspect and test ignition switches for contamination interference. any switches that fail the test will be repaired. owner notification began on novenber 3, 2003. owners should contact honda at 1-800-999-1009. 05/13/13 Transmission and Drivetrain Honda is recalling certain model year 2012-2013 cr-v, odyssey, and model year 2013 acura rdx vehicles. during sub-freezing temperatures, the brake-shift interlock blocking mechanism may become slow and allow the gear selector to be moved from the park position without pressing the brake pedal. as such, these vehicles fail to conform to the requirements of federal motor vehicle safety standard 114, "theft protection and rollaway prevention." 08/19/03 Transmission and Drivetrain On certain sport utility vehicles equipped with automatic transmissions, excessive corrosion of the shift cable linkage could prevent the driver from shifting the automatic transmission into park. If the vehicle operator fails to engage the parking brake, the vehicle could roll and a crash could occur. dealers will inspect the shift cable linkage for corrosion. if corrosion causes binding, they will replace the shift cable. Dealers will also install a new corrosion-resistant control pin. owner notification began on august 19, 2003. owners should contact honda at 1-800-999-1009. Honda recall no. p04.customers can also contact the national highway traffic safety administration's auto safety hotline at 1-888-dash-2-dot (1-888-327-4236). 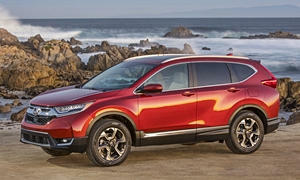 04/17/12 Suspension and Steering Honda is recalling certain model year 2006 cr-v vehicles. the weld strength attaching the sub-frame bushing collar to the passenger-side front lower arm is insufficient. the collar can separate from the arm due to vibration while driving. As a result, a loss of steering can occur, increasing the risk of crash. Honda will notify owners, and dealers will inspect the production lot stamp on the passenger-side front lower arm and, if necessary, replace the lower arm, free of charge. the safety recall is expected to begin on or about april 17, 2012. owners may contact honda customer service at 1-800-999-1009. Honda's recall campaign number is s33.customers may contact the national highway traffic safety administration's vehicle safety hotline at 1-888-327-4236 (tty: 1-800-424-9153); or go to http://www.safercar.gov. 01/26/15 Electrical and Air Conditioning American honda motor co. (honda) is recalling certain model year 2001-2005 honda civic, 2003-2004 civic cng and element, 2002-2005 cr-v, 2002-2004 odyssey, 2003-2005 accord, pilot, civic hybrid, and acura mdx, 2005 acura rl and 2006 honda ridgeline vehicles originally sold, or ever registered, in geographic locations associated with high absolute humidity. specifically, vehicles sold, or ever registered, in alabama, florida, georgia, hawaii, louisiana, mississippi, south carolina, texas, puerto rico, u.s. virgin islands, saipan, guam, and american samoa are addressed by this recall. upon deployment of the passenger side frontal air bag, excessive internal pressure may cause the inflator to rupture. In the event of a crash necessitating deployment of the passenger?s frontal air bag, the inflator could rupture with metal fragments striking the vehicle occupants potentially resulting in serious injury or death. Honda will notify owners, and dealers will replace the passenger side air bag inflator, free of charge. the recall began january 26, 2015. owners may contact honda customer service at 1-800-999-1009. Owners may also contact the national highway traffic safety administration vehicle safety hotline at 1-888-327-4236 (tty 1-800-424-9153), or go to www.safercar.gov.note: this recall supersedes safety recall 14v-353, with the exception of vehicles originally sold, or ever registered, in california.those vehicles will continue to be addressed, and a free remedy provided, under that safety recall campaign.this recall also includes vehicles in the specific geographic areas listed above that were included within safety recalls 13v-132 and 14v-349. 09/12/14 Electrical and Air Conditioning American honda motor company, inc.'s (honda) is conducting a limited regional recall for certain model year 2003-2005 accord, civic, cr-v, pilot and acura mdx, model year 2003-2004 odyssey and element, and model year 2005 acura rl, and 2006 honda ridgeline vehicles originally sold, or ever registered in california, and equipped with takata-brand air bag inflators. upon deployment of the passenger side frontal air bag, excessive internal pressure may cause the inflator to rupture. Honda will notify owners, and dealers will replace the inflators in all affected vehicles, free of charge. the recall is expected to begin during august 2014. owners may contact honda customer service at 1-800-999-1009. 11/02/12 Electrical and Air Conditioning Honda is recalling certain model year 2002-2006 cr-v passenger vehicles, manufactured from february 19, 2002, through july 28, 2006. the driver-side power window switch may fail or melt. 04/27/12 Electrical and Air Conditioning Honda is recalling certain model year 2002 through 2004 cr-v; model year 2003 through 2005 pilot; and model year 2002 and 2003 civic vehicles. in march 2012, honda filed a defect report to recall certain model year 2002 through 2004 cr-v and certain model year 2003 pilot vehicles. in august 2012, honda informed the agency that it was including an additional 820,789 vehicles including certain model year 2004 and 2005 pilots and model year 2002 and 2003 civics. the total number of vehicles being recalled is now 1,375,217. due to tension from the combination switch wiring harness, wear on the surface of the electrical terminal can occur, yielding copper oxide, which increases electrical resistance. increased electrical resistance may cause the terminal ends to melt within the wiring harness connector. If the terminal ends melt within the wiring harness connector, the low beam headlights may become inoperative, reducing driver visibility and increasing the risk of a crash. Honda will notify owners, and dealers will repair the low beam terminal harness or replace the lighting switch as necessary, free of charge. the original recall began in april 2012. owners of vehicles involved in the september 2012 expansion will be notified in september 2012. owners may contact honda customer service at 1-800-999-1009. Honda's recall campaign number for the original recall is s34.honda's recall number for the additional vehicles is s51.customers may contact the national highway traffic safety administration's vehicle safety hotline at 1-888-327-4236 (tty: 1-800-424-9153); or go to http://www.safercar.gov. 09/30/11 Electrical and Air Conditioning Honda is recalling certain model year 2006 cr-v passenger cars manufactured from october 3, 2005, through july 21, 2006. the driver-side power window switch may fail or melt. If the switch fails, the power windows may become inoperative preventing them from being rolled up or down. if the switch melts, it will produce smoke and a fire could occur. Honda will notify owners, and dealers will replace the driver side power window switch assembly free of charge. the safety recall is expected to begin on or about october 5, 2011. owners may contact honda automobile customer service at 1-800-999-1009. Honda's recall campaign number is r93.owners may also contact the national highway traffic safety administration's vehicle safety hotline at 1-888-327-4236 (tty 1-800-424-9153), or go to www.safercar.gov. 01/24/11 Electrical and Air Conditioning Honda is recalling certain model year 2010 honda accord and cr-v vehicles. there is a potential failure with the engine wiring harness connector which may cause intermittent spark firing or the engine to stall. Dealer will inspect and replace the ignition wiring harness connector free of charge. the safety recall is expected to begin on or before january 24, 2011. owners may contact honda at 1-800-999-1009. 11/19/04 Electrical and Air Conditioning On certain passenger vehicles, the occupant position detection system's side sensor is not installed in the correct position and may fail to shut off the passenger's side impact airbag if the occupant is out-of-position. In the event of a crash, such an out-of position occupant may be injured by a deploying side airbag. Dealers will replace the passenger's seat-back pad which incudes the occupant position detection system sensor. the recall began on on november 19, 2004. owners should contact honda at 1-800-999-1009. Honda recall no. p49.customers can also contact the national highway traffic safety administration's auto safety hotline at 1-888-dash-2-dot (1-888-327-4236). 06/16/04 Electrical and Air Conditioning On certain sport utility vehicles, the wire harness of the driver's front air bag was incorrectly wired. In the event of a crash, the air bag inflation rate would be incorrect, which could increase the risk of injury to the driver. Dealers will repair the wiring. owner notification began on june 16, 2004. owners should contact honda at 1-800-999-1009. Honda recall no. p34.customers can also contact the national highway traffic safety administration's auto safety hotline at 1-888-dash-2-dot (1-888-327-4236). 11/14/12 Other Honda is recalling certain model year 2012 cr-v, equipped with the lx trim level and manufactured from august 30, 2012, to august 31, 2012. these vehicles fail to comply with the requirements of 49 cfr part 567, "certification." the incorrect values for gross vehicle weight rating, gross axle weight rating front and rear, tire size, and rim size were specified on the safety certification label. Honda's recall campaign number is s62.owners may also contact the national highway traffic safety administration vehicle safety hotline at 1-888-327-4236 (tty 1-800-424-9153), or go to www.safercar.gov. 08/13/02 Other On certain sport utility vehicles, the front seat anchorage nut strength is insufficient because the nuts were installed improperly. if a collision occurred, the seat anchorage would not withstand the force, and the front seat occupants would not be restrained properly. Telephone calls were made to each owner and the vehicles have been replaced. 11/14/01 Other Vehicle description: sport utility vehicles equipped with automatic seat belt pretensions. the cr-v is equipped with two seat belt pretensioners - retractor and buckle - in both the driver and front passenger seating positions. some buckle pretensioners use a part that restricts the full motion of the mechanism. If these pretensioners activate in a crash, the seat belt could unlatch, leaving the front seat occupants unrestrained. Dealers will repair both front seat belt buckle pretensioners. customers will be provided with a rental car. owners were originally contacted on november 14, 2001. a followup owner notification letter is being mailed during december 2001. owners who take their vehicles to an authorized dealer on an agreed upon service date and do not receive the free remedy within a reasonable time should contact honda at 1-800-999-1009.